Learn how to customize the channels and publishers that are eligible to serve your ad so you can optimize sources of traffic. RTX Platform works with various partners that supply traffic to your campaigns. You'll see these traffic sources listed as channels and publishers. Channels are larger groups of traffic sources, and publishers are smaller subsets of channel traffic, each of which can be paused or enabled to turn specific sources of traffic on or off. Because every campaign is different, you should monitor how each channel and publisher performs for your unique campaign and optimize accordingly by pausing channels and publishers with poor performance. TIP: You can place custom bids on each channel to optimize ROI. Learn more about structuring your bids. TIP: Use RTX Platform reporting to measure performance for each channel and publisher that has served your ad. When a channel or publisher is enabled, you are eligible for impressions from that channel or publisher. Similarly, when a channel or publisher is paused, you are not eligible for impressions from that channel or publisher. TIP: All channels and publishers are enabled by default. As a best practice, you should only pause specific channels and publishers once you've collected enough data to determine that they do not perform well for your campaign. If a channel or publisher performs poorly for all of your Push campaigns, you can pause it at the global level. When a channel or publisher is paused globally, none of your campaigns will be eligible from traffic from the paused channel or publisher. NOTE: If a channel or publisher is paused at the global level, it will still be shown as enabled at the campaign and ad group levels, but it will not receive traffic. Follow the steps below to pause or enable channels or publishers globally across all campaigns. 1. Click Push at the top of the page, then click Channels or Publishers in the secondary navigation bar below. 2. 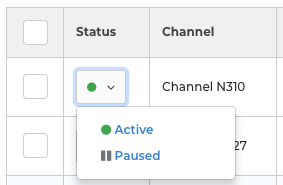 To pause or enable a single channel or publisher, click the icon in the Status column next to the channel or publisher you want to update, then select the green dot to enable it, or the gray bars to pause it. 3. 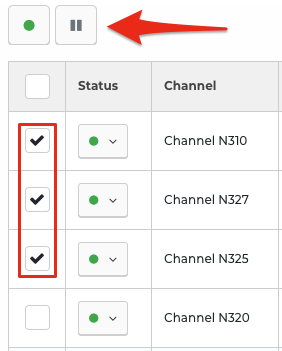 To pause or enable multiple channels or publishers, check the box in the leftmost column next to each channel or publisher you want to update. Then, click the button with the green dot above the table to enable the selected channels or publishers, or click the button with the gray bars to pause them. If a channel or publisher performs poorly for all ad groups in your campaign, you can pause it at the campaign level. When a channel or publisher is paused at the campaign level, no ad groups within that campaign will be eligible from traffic from the paused channel or publisher. NOTE: If a channel or publisher is paused globally, it will still be shown as enabled at the campaign level, but it will not receive traffic. Follow the steps below to pause or enable channels or publishers at the campaign level. 2. Click the campaign that contains the channel(s) or publisher(s) you're updating, then click the Channels or Publishers tab. 3. To pause or enable a single channel or publisher, click the icon in the Status column next to the channel or publisher you want to update, then select the green dot to enable it, or the gray bars to pause it. 4. To pause or enable multiple channels or publishers, check the box in the leftmost column next to each channel or publisher you want to update. Then, click the button with the green dot above the table to enable the selected channels or publishers, or click the button with the gray bars to pause them. If a channel or publisher performs differently for different ad groups in your campaign, you can keep it enabled at the campaign level, but pause it for any ad group where it's performing poorly. TIP: You can place custom bids on specific channels at the ad group level, which will override your ad group's default bid. If a channel performs well, raise its bid to be eligible for more impressions. Learn more about structuring your bids. NOTE: If a channel or publisher is paused globally or at the campaign level, it will still be shown as enabled at the ad group level, but it will not receive traffic. Follow the steps below to pause or enable channels or publishers at the ad group level. 2. Click the ad group that contains the channel(s) or publisher(s) you're updating.